Choose dark green firm mangoes and very sour to taste. If they have long stalks, cut them and place them upside down on a plate or a vessel so that the sap completely runs down and dries off. This sap produces itchy sensation and irritation when comes in contact with our skin. Then wash them thoroughly, wipe it clean with out any trace of moisture and leave them for an hour or two till they are dry. Or just wipe them well with a damp cloth and then with a dry cloth. But ensure that there is no moisture on them. Mangoes have a very hard "stone" inside. 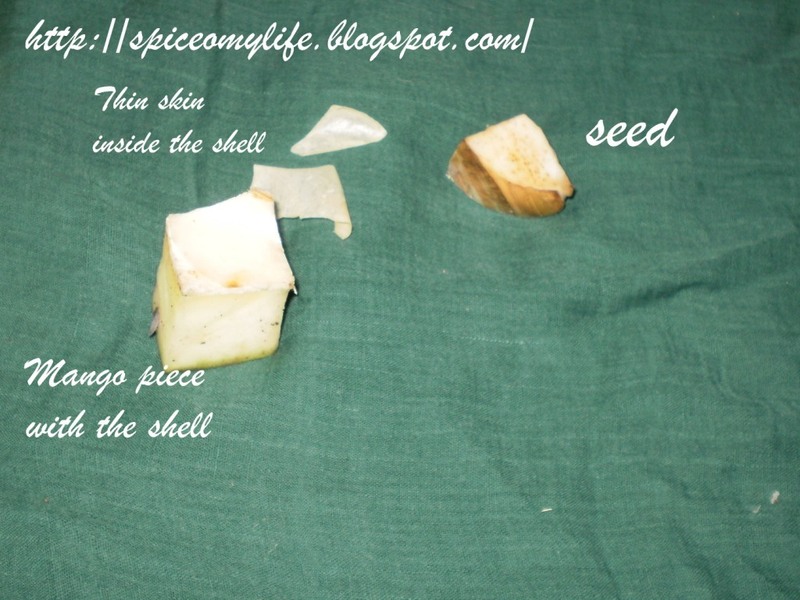 This stone consists of a hard shell on the out side and the seed inside known as Jeedi(జీడి) in Telugu. The mangoes have to be cut through the stone inside into eight to ten pieces depending on the size of the piece you want. The pieces should not be too big or too small. A special type of cutter is used for this. Without this cutter it is difficult to cut the mangoes especially when you have to pickle a large number. Usually in India where we buy the mangoes in the market, people with these cutters cut the mangoes for some money. Each piece should have the hard covering of the stone. Without this, the pickle cannot be preserved for long. Remove the seed and a thin film like skin sticking on the inside of the shell. Pick and keep aside all those pieces which do not have the shell attached to them. 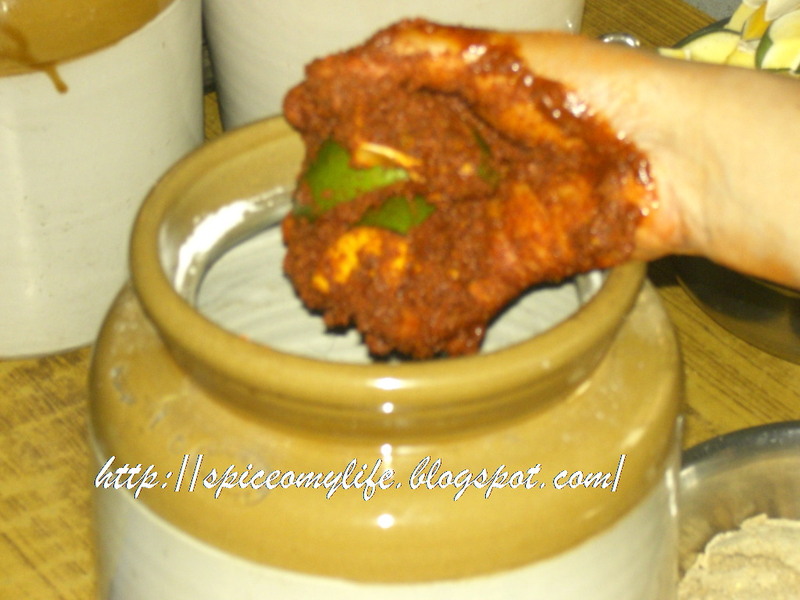 They can be used for making chutneys (will give the recipes separately). However these cannot be preserved for more than a week or so. 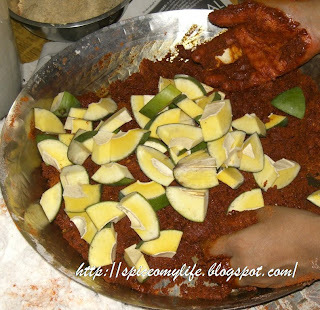 Keep all other ingredients ready so that the pickle can be made on the same day the mangoes are brought home. If not made immediately, they become soft. 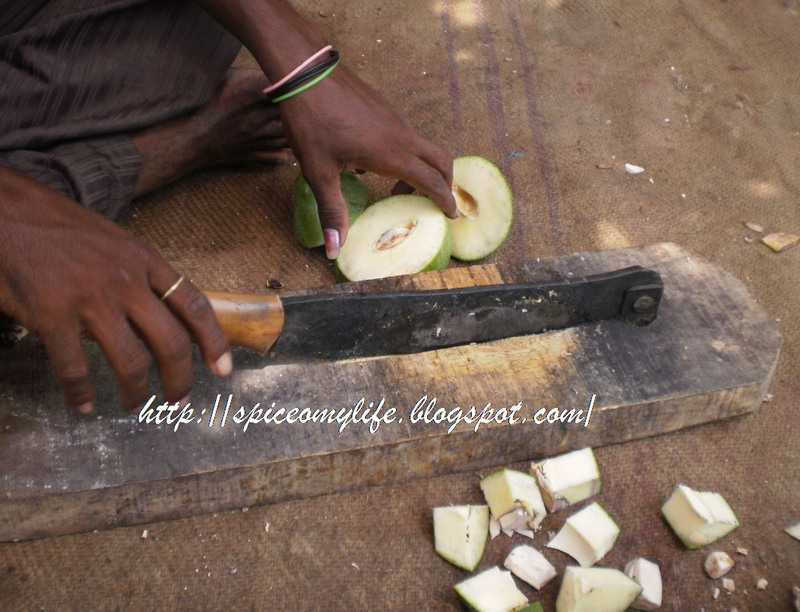 This is the special cutter used for cutting mangoes. The knife is joined at one end and very heavy and sharp. This is before cleaning the pieces and removing the seeds. 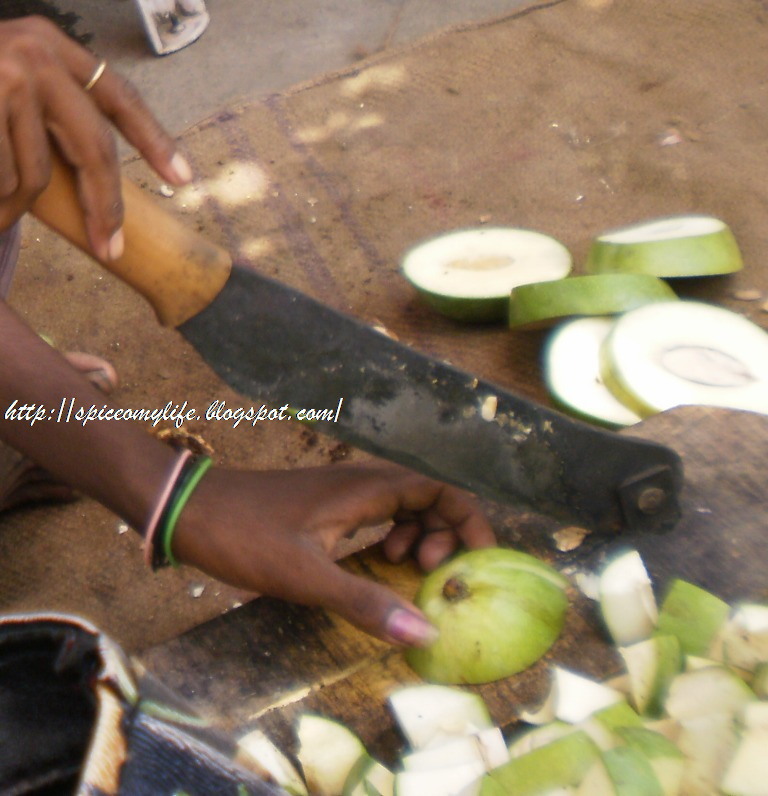 This is how the seed and the thin layer inside the shell are removed before pickling. This is after cleaning the pieces. I could not clean the fruit before cutting. Any way it was better this way. These are the ones without the shell, so separated for making chutney. They cannot be pickled. The first one is the simple Aavakaya. Aava means mustard, kaya means fruit -raw one- here mango. So the main ingredient here is the Mustard powder. 1. 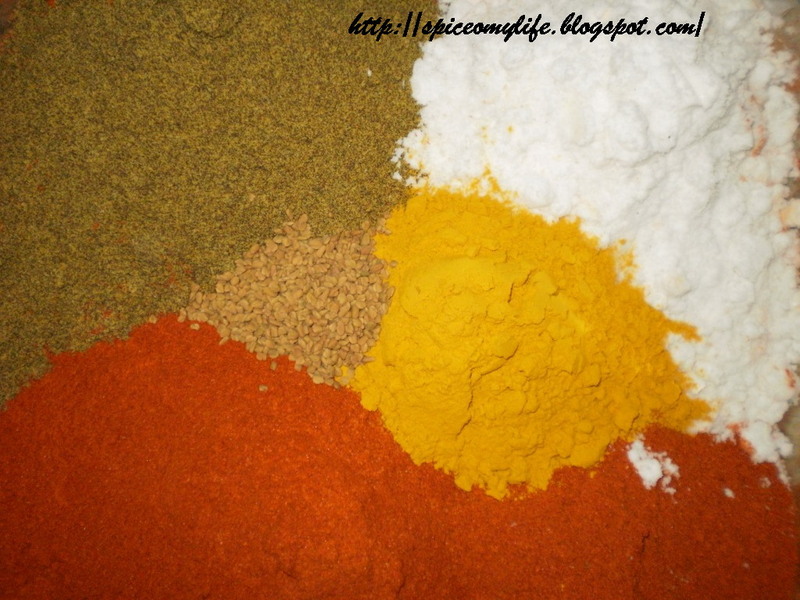 Quantities of Mustard, Red Chilli powder and salt are usually taken in equal quantities. One can vary the ratio according to taste. But this also depends on the sourness of the mangoes and also the size and quantities of the mangoes. 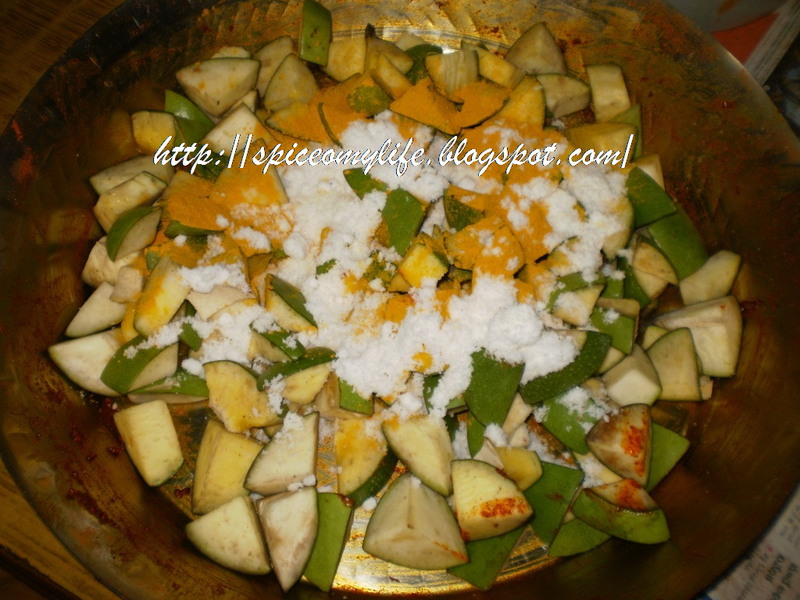 Some people want more mango pieces than the spice mixture. 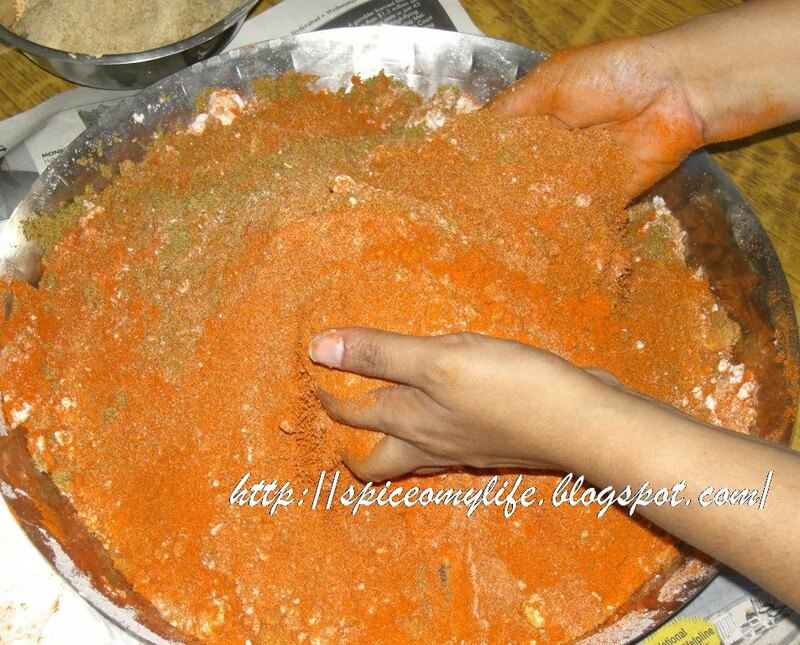 In that case, the quantity of spices can be reduced to 750 gms or 500 gms each instead of one Kg. 2. 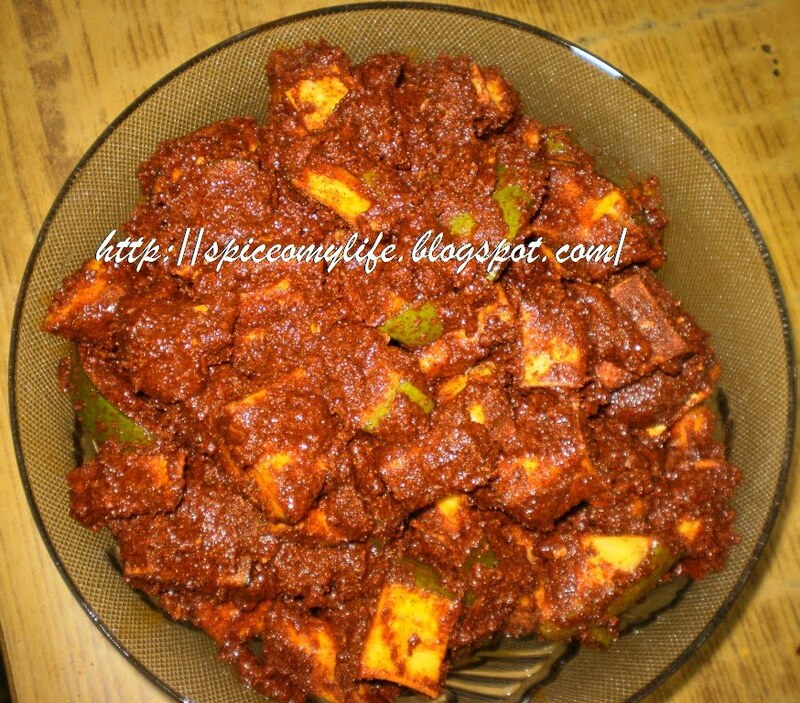 In addition to the above, I also add 500 gms red chilli powder of the variety (like Kashmir Chillies, Bhadrachalam or other such varieties) which give a very red colour to the pickle but not at all spicy or hot. This colour is maintained through out the year. 3. 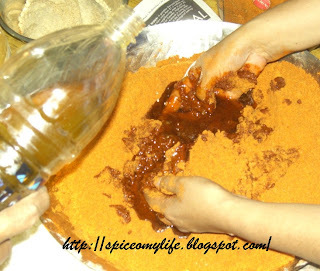 Now take the three powders in a big plate or a vessel wide enough for us to mix them freely. Now mix them well with both hands. add fenugreek seeds and turmeric powder and mix well again. 4. Add a little oil (use around 250 gms to 500 gms and keep the rest aside) at a time to this spice mixture, and mix well until the mixture is wet with oil. 5. 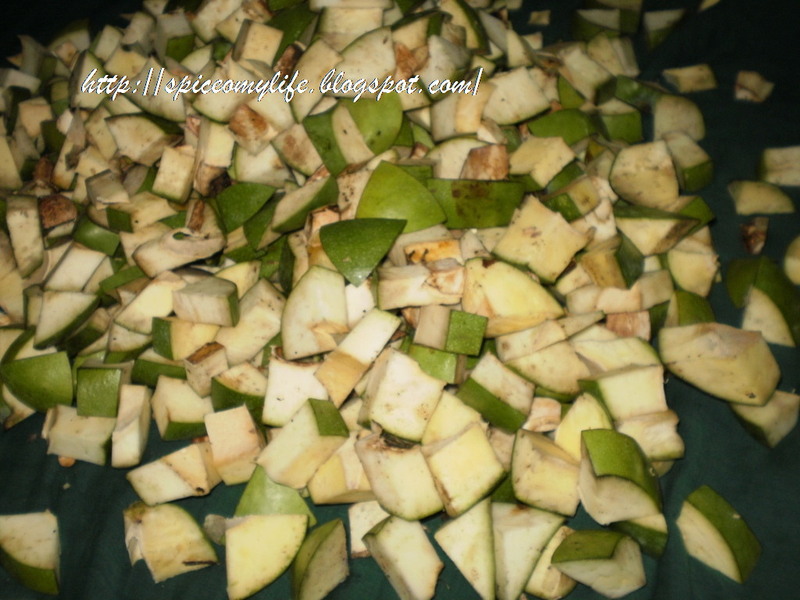 Now add the mango pieces few at a time. Roll them in the mixture until they are well coated. 6. In a ceramic Jar, first put a thin layer of the spice mixture, then put some pieces as prepared in 5 above. Again put a layer of mixture, then the pieces alternately until all the pieces are done. 7. Cover the jar with the lid and leave for three to four days. 8. By this time the mango pieces will marinate in the spice mixture and the spice mixture will be more slushy. 9. Now take the entire pickle into a plate and mix well thoroughly. 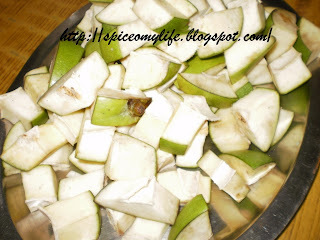 Taste it, and add salt or other spices according to your requirement. 10. Add vinegar (optional) and mix well. Vinegar helps in preserving the pickle, retaining the colour as well as keeps the mango pieces very crisp for a long time almost the entire year. Strictly speaking traditionally vinegar is not added by us South Indians. But as I have experimented with it, I find it very helpful. Though vinegar is acidic in taste, its taste is not at all noticeable in this pickle. So one need not fear in adding it. 11. Now put it back in the jar and pour the entire quantity of oil over it. It is ready for use though it will take few more days for the spices to sink into the pieces and blend in. Cover the top of the jar with a clean muslin cloth and tie it around the neck with a string. 12. 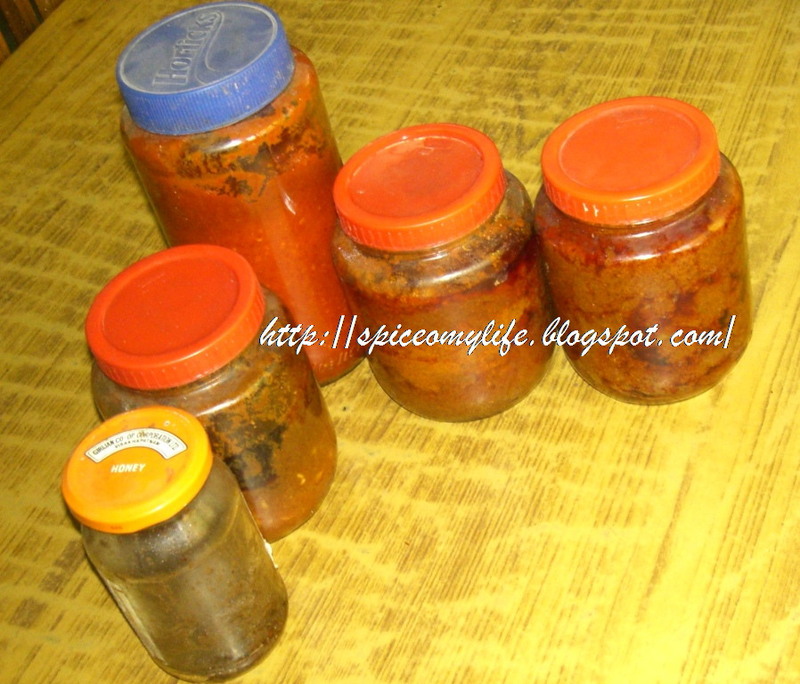 The quantity required for daily use can be kept separately in small jars. use a dry spoon when ever the pickle has to be taken out from the main jar. Here all the ingredients and the process is as above. Only thing is Chick peas are added to the spice mixture. 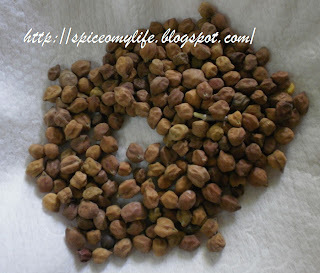 Chick peas or Bengal gram is known as Chana in Hindi and Senagalu in Telugu. Around a cup of the gram may be added. But use the small variety known as Desi chana not the big ones known as Kabuli or Mumbai chana. Here the main ingredient is the Green gram-but split and husked or skin removed. 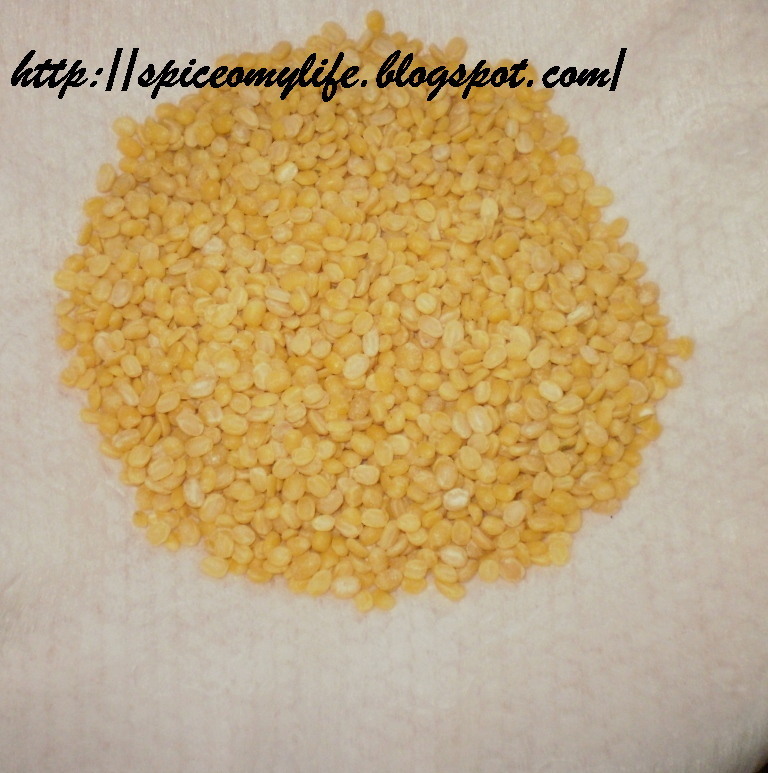 Split and cleaned Green lentil is known as Dhuli huvi Moong dal in Hindi and Peara Pappu in Telugu. The lentil should be cleaned and kept in hot Sun for an hour or two and then powdered. This is much more tastier than the usual Avakaya and less spicy. All the ingredients mentioned in Aavakaya (sl no 1) remain the same. 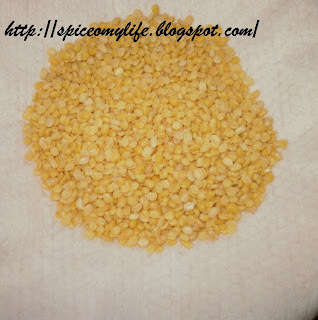 The only difference is mustard powder is substituted by same quantity of Lentil powder. Two Tbsps to Half cup of Mustard powder may be added if you feel so. Strictly speaking it is not required but some add it. Fenugreek seeds are not added. 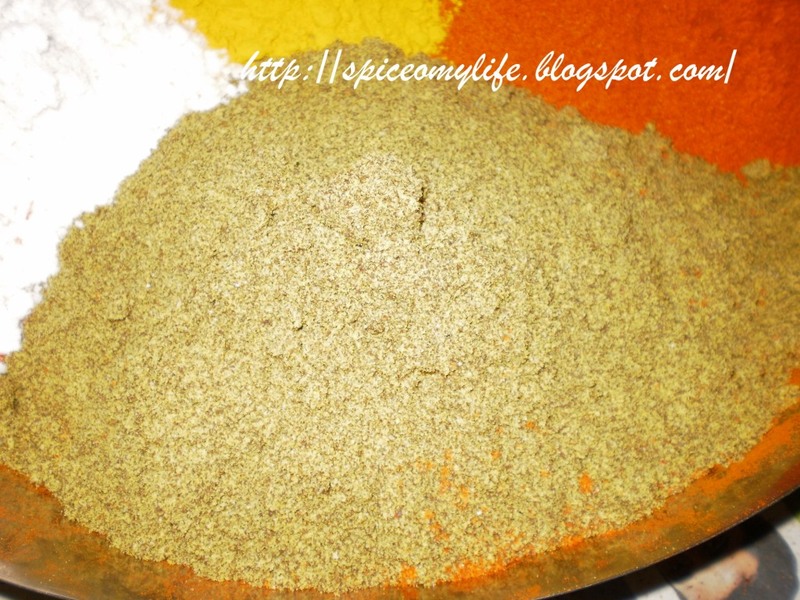 But some of my friends said that they add 2 Tbsps of roasted Fenugreek powder.